You are currently browsing the tag archive for the ‘Glebe Point Road’ tag. In this post I am discussing 2 main roads: the Pacific Highway & Parramatta Road. Travelling on either road is like travelling in different countries. I cannot help but be astounded by the difference. There is really no difference in the utility between the two roads except that Parramatta Road has many more shopping strips. However, I don’t see why this should mean there should be dearth of trees along its length. The section of Parramatta Road that is under the control of Marrickville & Leichhardt Councils is ugly & getting visually worse as the years pass. The almost treeless state of Parramatta Road under the control of these 2 Councils seems to be a planning decision that was probably made decades ago & little has been done to change it. Of course, there are other parts of this road that are just as treeless, but I am presently concerned with the section under the control of Marrickville, Leichhardt & City of Sydney Councils. You can see the demarcation line between Marrickville & Leichhardt Councils & the City of Sydney Council by looking for the presence of street trees. Once they start you are in City of Sydney territory. Once they stop you are in Marrickville & Leichhardt territory. 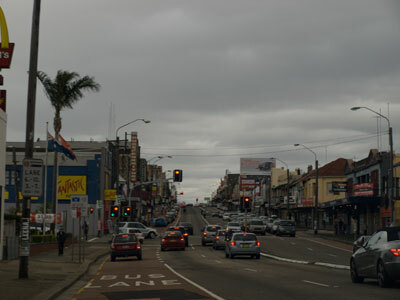 A random view of Parramatta Road at Stanmore. The Palm belongs to McDonalds car park. Sydney City has planted quite a number of Eucalypts along their section of Parramatta Road & the trees are already looking good. Sydney Council’s action proves it can be done. Interestingly they planted Eucalypts, trees which some regard as dangerous because of falling branches. Mind you, the branch die-off is a slow process & is clearly visible to the naked eye. I’d guess that Sydney City Council chose to plant Eucalypts because they grow tall & straight, grow rapidly & also flower providing food for the birds. I’d also guess they made a decision to check on the trees occasionally & prune any branches that die off as part of general maintenance. 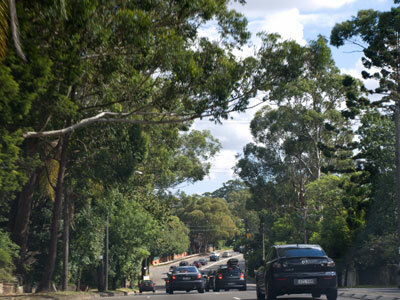 The Pacific Highway is filled with a variety of tall growing trees along its length, again proving that trees can exist on a main thoroughfare. The trees don’t cause visibility problems for the traffic & they certainly help keep pedestrians safer. The trees also provide a pollution barrier to local housing by capturing particulate matter from the exhausts of passing traffic. People who live within a block of the Pacific will have much cleaner air than those who live along or near Parramatta Road. Parramatta Road opposite McDonalds at Stanmore looking towards the city. It annoys me that Sydney’s Inner West of has to be exposed to more pollution, including visual pollution. 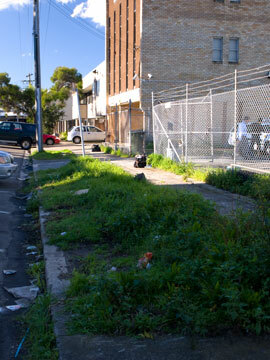 What does it take to cut out concrete & plant trees in available spaces along Parramatta Road? If Leichhardt & Marrickville Councils followed City of Sydney’s lead & planted 3-4 metre high saplings, the effect would be to instantly beautify & green the place. The trees would also have a much greater chance of survival, as they are not sitting ducks to be vandalized. 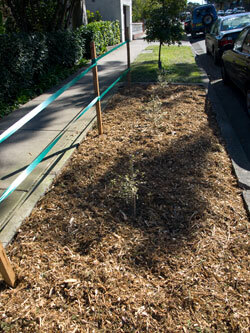 The new street trees recently planted along Glebe Point Road are proof of this. I know money is an issue, but is losing 95% of saplings planted each season due to dying for lack of water, accidents, vandalism & the like a wise investment? Wouldn’t it be better to plant bigger saplings which do cost more, but if watered, are more likely to survive? Couldn’t the nearest business owner be given a complementary watering can & asked to water the tree? Council could give them a big bright sticker to put in their window saying that they are caretakers of the street trees with much thanks from Council & the community. Something like I am a volunteer caretaker of the street tree/s outside this business. View of the Pacific Hwy just before Chatswood. 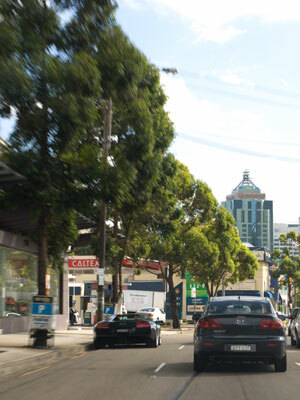 Even in this area street trees are regularly spaced & of a tall growing species. People notice these things. Couldn’t community appreciation awards be given each year to those people & businesses that kept the street trees alive? Surely this type of recognition would be good for their professional reputation because a large percentage of the community cares about green issues these days. My dream is that once businesses catch on to the fact that shoppers spend around 11% more where there are shady trees, they will be beating down Council’s door demanding trees be planted. 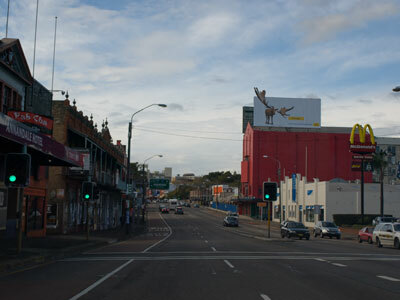 Parramatta Road is also a main route south of Sydney Harbour Bridge. Tourists travel along it daily & they will gain an impression of Sydney from this road. As for the Princes Highway, straight out from the airport……. The Princes is shamefully ugly. The section from St Peters to the Cooks River always looked dreadful &, like Parramatta Road, is only getting worse. Rockdale Council made their section look considerably better & more people-friendly by planting street trees every 3 metres along the whole length of the shopping strip. Rockdale Council prunes & maintains these trees & although they are trees in cages, they look good. It is the kind of care that is noticeable & makes people feel good, better connected in their communities & happier. Marrickville Council won’t do anything about this unless we let them know that we want more trees in areas like Parramatta Road where there is tree-poverty. We should not need to get used to ugliness when the solution is so simple & good for us & our children. If we work or live in areas with a predominance of grey infrastructure, it will have a negative impact on our health & our quality of life. Besides, the UN says we should be planting 14 billion trees a year across the planet if we are going to have a chance of holding back the thrust towards climate change.